We write historical romance about strong women who are equally as passionate about education for females, even in times when women were discouraged from serious study. For this purpose, we contribute a significant portion of the royalties for our annual holiday box set to the Malala Foundation. In 2015, our book sold 15,000 copies and made around $6,000 for Malala. We hope the 2016 edition will do as well. Did you know that over 60 million girls worldwide are out of school? 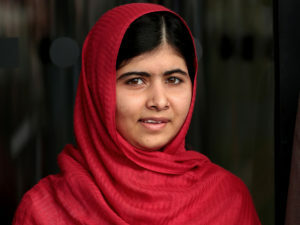 Education activist and co-founder of the Malala Fund, Malala Yousafzai, has shown that one child, one teacher, one book, and one pen can change the world. Amplify girls’ voices by giving them a platform to connect with the Malala Fund and each other. Support local leaders and organizations in Nigeria, Pakistan, Kenya, and places housing Syrian refugees. We invest in these on-the-ground organizations because we believe real, lasting change will ultimately come from empowered local leadership. Advocate for the necessary resources and policy changes to enable all girls to receive safe, quality education. Make a donation to our Team Page. Buy our holiday anthology when it releases in November.